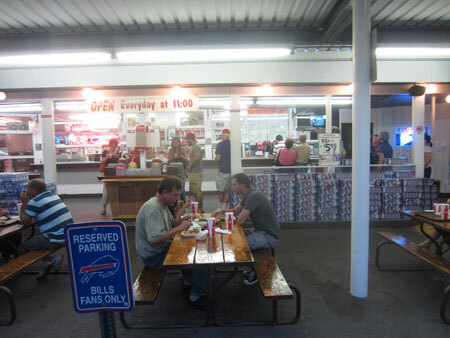 This summer marks the third annual “Last year for PJ’s Bar-B-Q.” Owner PJ Davis has been talking about converting his popular Saratoga Springs roadside food stand into a franchise-ready indoor restaurant for several years. 2011 could be the year he really builds it. You can view the artist’s rendering of Bar-B-QSA - the replacement restaurant - at the end of the long line of customers that are cueing up to place orders. Missing from the drawing are PJ’s trademark wall menus, the “Reserved Parking for Buffalo Bills Fans” parking signs, the spotless rustic picnic tables, stacks of Loganberry soda cases, the Baby Boomer’s wall of fame and Fats Domino window. When the new restaurant opens, Shelly’s charcoal-grilled hot dogs and roast beef on weck sandwiches had better not be missing, too. PJ's Bar-B-Q is giving up its popular eclectic existence to become a predictable indoor restaurant. There’s a wicked urge for business people who derive their success from being different to become the same as everyone else. The fingers of countless visitors to Saratoga in August are crossed that Davis isn’t among them. At the races, there was drama of a different sort. J.J. Castellano, currently third in the jockeys standings, held the crowd mesmerized when he fell from his mount at the 3/8 pole of the seventh race. Doing Great, a Virginia-bred filly by Great Nation that had won four of her seven lifetime starts, suffered heart failure in the $75,000 Lucy Scribner Stakes. Castellano tumbled forward as the horse hit the turf. He was taken from the track on a stretcher in an ambulance, yet was seen strolling through the grandstand minutes later. The results of two races were reviewed by the stewards before being made official. Summer Share, Law Enforcement, EZPZ Lemon Squeeze, Funny Sunny and Freud’s Honour lost races by a head or less. Like the old days, Indian Tale was a winner after resting three days since his last race. Bringing them back in a hurry is a practice that trainer Rick Dutrow likes. The up and over set was represented. Opera Heroine, a winner on Saratoga Preview Day, won the traditional Thursday steeplechase. The season’s pinkest-and-greenest garden party took place in the Fifth Avenue backyard of Peggy Steinman in the evening. Steinman, who you know from her beehive hairdo, stands a head taller than many in the jumping game and at the Museum of Racing. Most people invited had something to do with those interests. Celebrity chef Bobby Filet, aka Flay, will speak on Friday morning at the Hall of Fame induction ceremony. 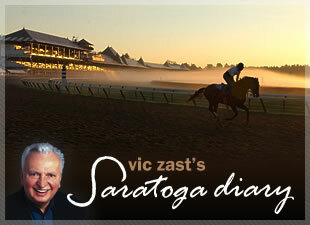 Vic Zast is the author of “The History and Art of 25 Travers.” He’s attended the races in Saratoga for 48 straight summers.